San Diego State University business professor David Blair became the first person in the city to receive a conditional use permit for legally operating a nonprofit medical marijuana dispensary. 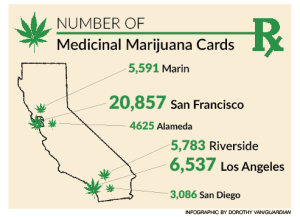 Although medical marijuana dispensaries were decriminalized in California by Proposition 215, known as the Compassionate Use Act, which was passed in 1996, San Diego County unsuccessfully challenged the law several times, and the city proper heavily restricted the number and locations of dispensaries. Marijuana use remains illegal under federal regulations. The City Council voted 8–1 to overturn its previous restrictions on Feb. 25 after medical marijuana proponents gathered enough signatures to force a reconsideration. According to the new rules, no more than 36 total dispensaries will be allowed in San Diego, and they must maintain a 1,000-foot buffer zone between public parks, churches, schools and other dispensaries. They must also stay at least 100 feet away from residential areas and cannot have on-site medical professionals. As of March, the dispensaries are completely barred from Council President Todd Gloria’s district, according to KPBS. Edith Gutierrez, a city development project manager, told the UCSD Guardian that 37 other applications were waiting to be processed, concentrated in a few major districts. The next hearing will be held on Oct. 29 for a dispensary hoping to open near Mission Bay. The application process is complex; it takes thousands of dollars and several months to complete and remains highly controversial. Many advocacy groups are strongly opposed to the new guidelines and certain marijuana shops still operate illegally within the county. 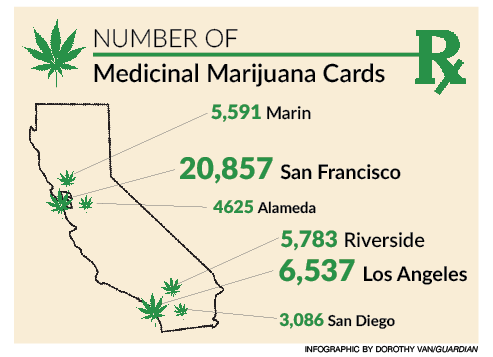 UCSD itself does not recognize medical marijuana cards and forbids smoking anywhere on campus. San Diego Mayor Kevin Faulconer, however, supports the regulations.